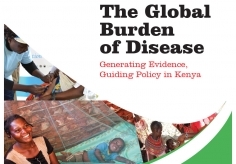 The report shows that Kenya has made incredible progress over the past 20 years to improve child health and to reduce the burden of leading infectious killers like HIV/AIDS, malaria, and tuberculosis. Kenyan leaders are looking toward the future and aiming to tackle the rising tide of non-communicable disease in their country (Figure 1). Combatting NCDs is a priority for Kenya, per its Vision 2030, which is the nation’s long-term goal for elevating Kenya to being a more prosperous, healthier country by 2030. The emerging epidemic of NCDs and related risks factors may reverse Kenya’s recent gains in health unless urgent and deliberate actions are taken. If the burden of NCDs continues to grow unchecked, it will have far-reaching socioeconomic effects in Kenya from households to the health system. “Sustaining Kenya’s population health gains over the past three decades remains precarious considering the rapid emergence of NCDs,” said Dr. Tom Achoki and Dr. Uzma Alam, co-authors of the report. With strong political support, GBD estimates for Kenya will help the country’s leaders forge a path to achieve better health for all.